One of the biggest trends for kitchens in 2014 is adding a splash of pattern and colour through a new splashback. The panel behind your sink, cooker or between the worktops and bottom of the wall units is a small but essential detail in your kitchen, protecting your wall from water and food stains, and a wide range is available to truly personalise your kitchen to your tastes. Splashbacks are available in a range of colours, patterns and materials, including glass, steel, wood and tiled. Installing a splashback is a simple job that will only take a couple of hours, and the adhesive shall be dry within 24 hours for the final touches. Within the course of a weekend you can completely transform your kitchen. First, prepare your chosen surface is completely clean, sealed and free from damp. Non self adhesive splashbacks will need a careful application of a strong, professional construction adhesive. Make sure you lay the splash back on a flat surface when applying the adhesive. Apply the adhesive in blobs a few centimetres apart from each other on the back of the splashback. Make sure you don’t apply adhesive close to the edge of the splashback, otherwise it will be squeezed out around the edge when you push the item to the wall, leaving a mess that will be very tough to clean. Now carefully push the splashback against the wall, evenly applying pressure over every part of it to make sure it is fitted securely. Use your spacers as a guide to keep the splashback straight. If you can sense any ‘gaps’ or bumps where the splashback is not attaching, quickly take the splashback off the wall and apply extra adhesive to the troublesome spots. 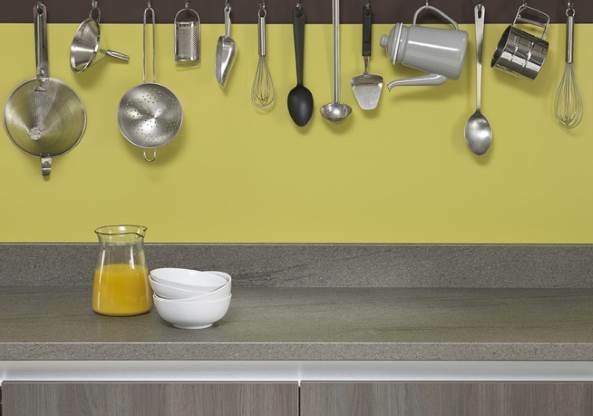 Once you are confident that the splashback is secured in place with no gaps or weak spots, secure the edges with thick masking to to the wall to keep the item in place as the adhesive dries. Give the adhesive a good 24 hours to dry. Do not touch or clean the splashback during this period. The next day, carefully apply a thin layer of sealant around the edges of the splashback for extra security. Now wash and buff the splashback and dry with a microfiber cloth to give it that extra sparkle. Previous Article Technology in the kitchen – What will be in the kitchen of the future? Next Article Should You Theme Your Child’s Bedroom?